Remember to pick a photo showing your OKC spirit. 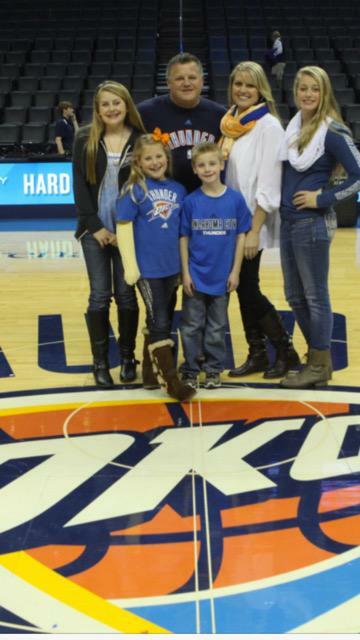 Your photo will be displayed at the Chesapeake Energy Arena in our Mosaic Display. Please stop by section 113 for personalized photo opportunities celebrating you! In order to view your full photo on the interactive video wall, please assure the entire photo fits within the ‘shield’ outlined within the cropping tool. Here are some submissions by other OKC fans. Remember to show your OKC spirit in your own photo! It's hard to believe it has been ten years since I celebrated the arrival of the Thunder to my hometown of OKC. We had always been the home of minor league sports, and happily so, with team favorites like the 89ers, the Blazers, the Cavalry....and of course our college favorites Oklahoma State University and the University of Oklahoma. But now we were a "major league city" and it made us feel better about ourselves. We were one of a handful of cities with an NBA team, and we were proud. The team seemed to mirror our qualities and virtues, and suddenly they WERE us, they reflected us to the rest of the world. Before the arrival of the Thunder, I would travel and when asked where I was from, when I told them Oklahoma City, I usually got a blank stare. But suddenly, since the arrival of this franchise, when I say I'm from Oklahoma City, people say, "OKC the home of the Thunder", we were now on everyone's map. But in an even more personal way, it has given me back some time with my younger brother. He and I bought season tickets together on day 1, and that has become our time. It's time we spend together, sharing both the highs and lows of the seasons. We usually ride to and from the games and eat together before the games. So during the season, for 42 games, we get to spend 3-4 hours together, and it has been wonderful. That's what I love about the Thunder, they are family, and have given me the time and ability to enjoy my family along with them. The Thunder is more than just a sports team, they are us, they are the people and pride of Oklahoma City, and they make us feel good about ourselves and about being from here and living here. That is a big deal, and I'm proud to tell people that I'm a season ticket holder for the Thunder games, and hope to pass them on to my kids when I get too old to go to the games. Thank you Thunder. Our family bought season tickets the first season. Our kids were barely toddlers. At that time, there was no mascot. During Wednesday night games, some fans would dress up as mascots and enter a contest. The crowd would cheer and decide who was best for the night. Our kids loved meeting them all, and cheering for their favorites. Our kids were invited down during half-time 2.17.09 for the introduction of the real mascot rumble. Our account rep said they didn't know if kids would think rumble was scary, so they asked our kids what they thought. Our kids were excited, and thought rumble was awesome! They were able to go on the court as he came down on the platform playing the drums. Our kids learned to catch the Little Caesars pizza, frisbees and later Pizza hut, and loved to chase down the parachutes from the daily Oklahoman. They most enjoyed the Midfirst sign competition. They tried over and over to win. A couple days before Christmas, they made a sign with a Santa and a hole for a face that said "ho-ho-ho, show me the dough". Ashlyn at age 10, won $200. She is now 19! Our boy Gwen, loved our isle seats and the cheerleaders. At barely 2 years old, our isle seats had plenty of room for him to run around and say hello to the cheerleaders. He is now 11. He has always enjoyed the Thunder hot dog and can eat the entire thing! He has literally grown up with the Thunder. Our youngest daughter Abigayle, memorized the cheerleader’s names year after year. She was 3 years old the first year of the thunder and now cheers for her school and competitive cheer team at age 13. Our 7-year old daughter Addison is now 17 years old. Since she was 7 years old, her favorite player was Jeff Green... because he had signed her jersey at our very first fan appreciation event. At the same event, Nick Collision also greeted her and her sister and asked to take a picture with them. Nick quickly became her favorite and still is. We have met him many times over the years and he is as friendly as he was in his early years. We have several photos of our girls growing up in pictures with Nick. Though we love to take our family to the games, my wife and I love date night at the Thunder as well. My wife Tanet, would rather go to a Thunder game for date night than any other place. It’s one of those things that has kept us married for 24 years! 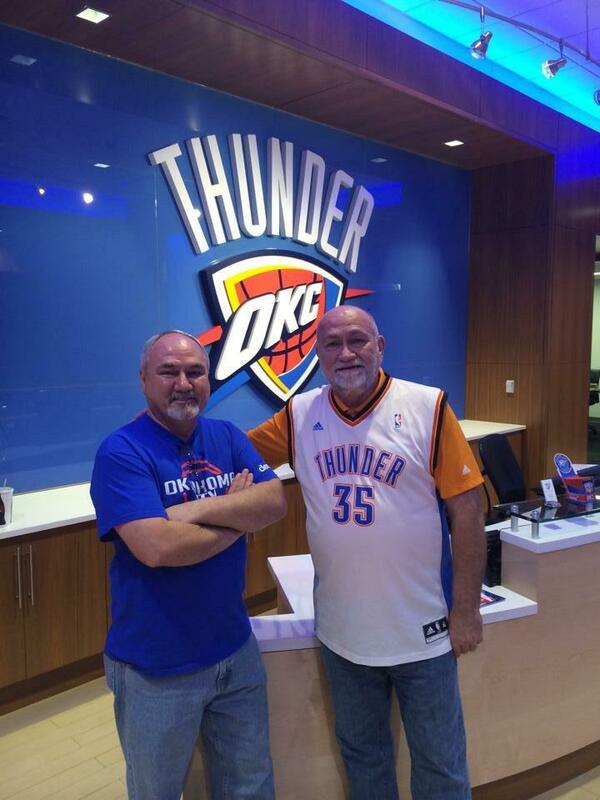 We both get to enjoy what we love, thunder basketball…and we get to go together. When we are unable to go to games, our kids are old enough to take friends. Also, our employees will change any plans to attend a game. Their family and friends enjoy the games as well. We have found offering great seats to the Thunder help with employee retention. Our clients and friends also love to attend the games. I do not recall a time in 9 seasons that our 6 seats were empty. Our family and business have grown with the thunder. We have been spoiled with the winning ways over the past several years. We can recall the days when our kids were just toddlers. The excitement to go to the game and cheer our team to an upset was worth every penny! The time with our family and the Thunder, PRICELESS! By clicking submit, you: (i) irrevocably authorize The Professional Basketball Club, LLC d/b/a The Oklahoma City Thunder and any individual or company acting for or on its behalf (collectively, the “Company”) to display, broadcast, reproduce, modify, alter, create derivative works of and otherwise use and permit others to use your name, image, likeness, appearance, voice, professional and personal biographical information, My Thunder Story entry, and all other submissions by you to Company in any and all materials created by or on behalf of the Company on a perpetual basis throughout the world and in any medium or format whatsoever now existing or hereafter created, and for any purpose, including but not limited to advertising, public relations, publicity, packaging and promotion of the Company and its affiliates and their businesses, products and services, without further consent from or royalty, payment or other compensation to you; and (ii) acknowledge and agree that you have read, understood, and consent to all of the terms of this Publicity Waiver and Release, and are over the age of 18, or are the parent or legal guardian of a minor over the age of 13 submitting an entry into My Thunder Story and hereby consent to the terms of this Publicity Waiver and Release on behalf of that minor.